St Margaret's is an eye-catching 19th century church with one of the most extraordinary towers in Britain. It is known as the "Marble Church" because of the 13 different kinds of marble used to create the ornate interior. When Henry Peyto-Verney, 16th Baron Willoughby de Broke died in 1852, his wife, Lady Margaret, decided to build a new church in his honour - though there was no parish for the church. She chose as her architect John Gibson, a Warwickshire architect who had studied under Sir Charles Barry, architect of the Palace of Westminster in London. The richly carved and decorated tower shows Barry's stylistic influence. Gibson designed an extraordinary building, notable for two features. First there is the remarkable tower, standing 62 metres high, which seems disproportionately tall for the body of the church, as if it is about to take flight. Then there is the church interior, made with several different kinds of marble, imported from Belgium, Italy, France, Ireland, and England. The main building material was limestone from Llanddulas, which has been described as looking like porcelain when worked. The church was dedicated to both St Margaret of Antioch and to St Kentigern. In honour of the Scottish Kentigern, granite from Aberdeen was used to create niches by the main entrance. The pillars are of Belgian marble, the nave entrance of stone from Anglesey, and throughout the interior is lavishly carved woodwork. The church was begun in 1852 and consecrated in 1860, at a cost of Â£60,000, an extraordinary figure for what was simply a parish church. Indeed, the new parish of Bodelwyddan had to be created just for the church. Before Lady Margaret's efforts the communities of Faenol, Pengwern, and Bodelwyddan, had formed part of St Asaph parish. In the churchyard is the grave of Elizabeth Jones, mother of the explorer Sir Henry Morton Stanley (of Stanley and Livingstone fame). Also in the churchyard are the graves of 80 Canadians stationed locally in WWI, plus British war graves of the same era as well as later ,military graves from WWII and the Falklands conflict. St Margaret's is a landmark for traffic passing on the A55. 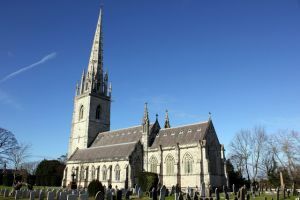 It is exceptionally easy to see the church from a great distance due to the striking tower - in fact its hard to take your eyes off it as you approach the exit to Bodelwyddan village. I've seldom seen a more eye-catching church than St Margaret's. Location: Off the A55, easily visible on entering the village.